The apartment has two bedrooms with a double bed of 1.50 x 2.00 each, and a small interior balcony furnished with table and chairs where you can enjoy the wonderful weather of Seville, and two full bathrooms, one of them with shower and the other with bathtub. The kitchen is modern, and fully equipped, and is integrated into the living room, which also has a double sofa bed of 1.40 x 2.00, and some comfortable armchairs. The entire property has been decorated and furnished in detail, with design furniture and combining modern and classic to create an atmosphere of comfort, comfort and relaxation. The apartment is located at Baños Street, where the old town of the city of Seville beggins. In the surroundings there are some of the most typical and authentic restaurants and bars in the city, where you will be able to enjoy the best tapas of Seville and the best dishes of Andalusian cuisine. In addition, it’s close to the shopping area, supermarkets, and bid malls. Of course all the important monuments of the city are just a few minutes walking from the apartment, so you won’t need transportation of any kind. The centre of Seville is an outstanding place to stay in, not only because of how convenient it is, but because of its joyful and nice atmosphere that can be enjoyed at any time of the day. Furthermore, the wide offer of restaurants and pubs allows the tourist to taste our well-known tapas. The tapeo is a concept that everybody who comes to Seville should get used to with, and there is a wide variety of possibilities in the centre of this city so that you have the possibility to choose whatever suits you best. The apartments located in this zone are very renowned and unique, since everything you may need, restaurants and pubs can be found there so that nothing stops you from finding the nature of the Andalusian lifestyle. Thanks to its location, this part of the city plays an important role during Semana Santa (Holy Week), since all the religious processions pass this zone because of it being one of the places included in the official itinerary. Furthermore, if you wish to go shopping, you can go from Plaza Nueva square to La Campana, and you will pass Sierpes street and its adjoining streets (Tetuán, Cuna, Rioja,…), where you can find a number of shops. The streets located in the city centre display typical Andalusian features and having a walk down them is something that every single traveller who comes to Seville should experience. While having a walk, you can tell how the narrow streets lead into beautiful squares, which are meeting points for people from Seville. Worth mentioning are the Plaza del Duque square and Plaza de la Encarnación square, which make their way among the narrow streets that surround them. As for the latter, it is worth highlighting the Metropol Parasol, popularly known as the “mushrooms of the Encarnación square”. This is a building that flies over the place and is home to several installations, such as the scenic overlook, where you can contemplate wonderful views of the city of Seville. 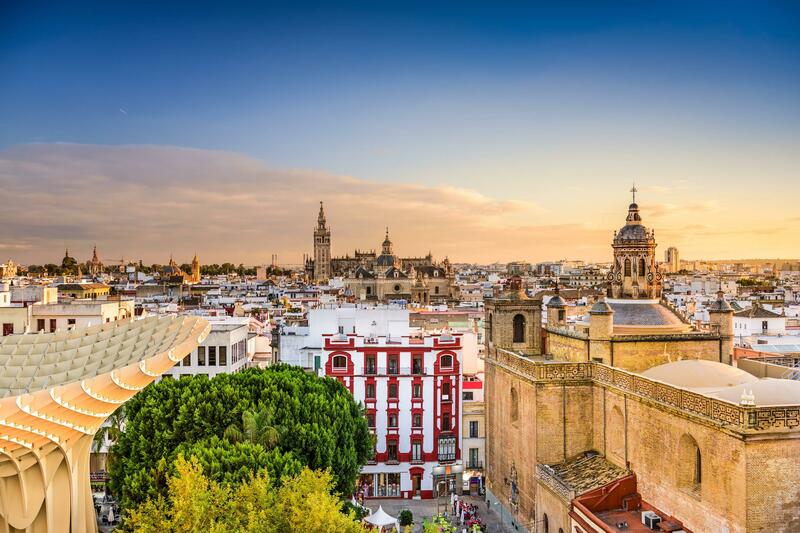 Within a few minutes, you will be able to visit other places of touristic interest, such as the Cathedral of Seville or the Giralda tower, that are places to be visited by every single tourist who comes to Seville, since both of them beside the “mushrooms” and the Torre del Oro tower define the skyline of Seville.